The soprano Therese Thoma was born in Tutzing, Bavaria. She was one of sixteen children and she studied with her father Jakob Thoma and with Franz Lachner at the Court Theatre. She debuted at the Court Theatre in Karlsruhe in 1865 and in 1866 she first performed in Munich. In 1868 she married the tenor Heinrich Vogl, with whom she had been performing since 1866. In 1870 she was Sieglinde in Wagner's "Die Walküre" with Heinrich playing Siegmund. In 1878 she sang Brünnhilde with Heinrich singing the part of Siegfried. She was also the first to perform the part of Brünnhilde in the UK. 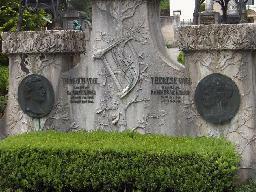 For many years she and her husband interpreted Tristan and Isolde as well. After a quarrel with the Wagner family she and her husband no longer appeared at the Bayreuth festival. After her voice started to detoriate she left the stage in 1892 as a final performance as Isolde in Munich. In 1870 the Vogls had bought a house in Tutzing and then a larger property in the neighbourhood. 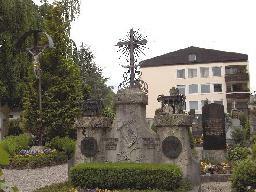 Her husband died in 1900 and she moved back to Tutzing in 1919, where she lived for the remainder of her life.